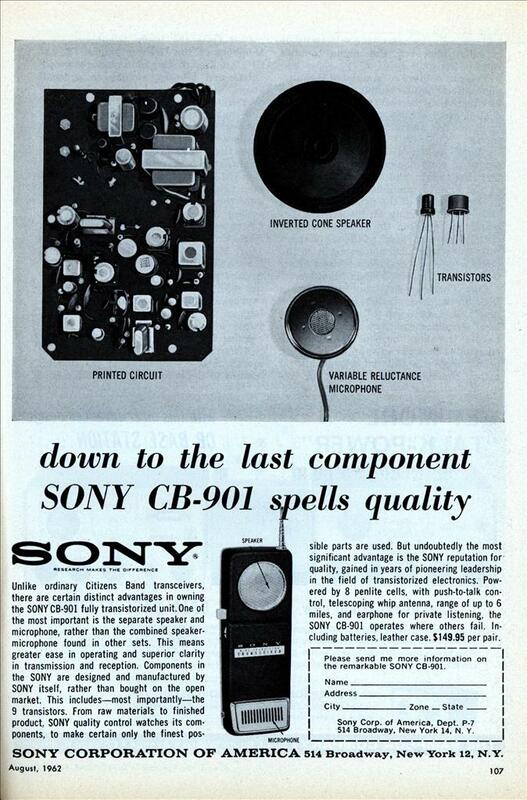 Unlike ordinary Citizens Band transceivers, there are certain distinct advantages in owning the SONY CB-901 fully transistorized unit. One of the most important is the separate speaker and microphone, rather than the combined speaker-microphone found in other sets. This means greater ease in operating and superior clarity in transmission and reception. Components in the SONY are designed and manufactured by SONY itself, rather than bought on the open market. This includes—most importantly—the 9 transistors. From raw materials to finished product. SONY quality control watches its components, to make certain only the finest pos- sible parts are used. But undoubtedly the most significant advantage is the SONY reputation for quality, gained in years of pioneering leadership in the field of transistorized electronics. Powered by 8 penlite cells, with push-to-talk control, telescoping whip antenna, range of up to 6 miles, and earphone for private listening, the SONY CB-901 operates where others fail. Including batteries, leather case. $149.95 per pair. SONY CORPORATION OF AMERICA 514 Broadway, New York 12, N.Y. This is trip down memory lane. 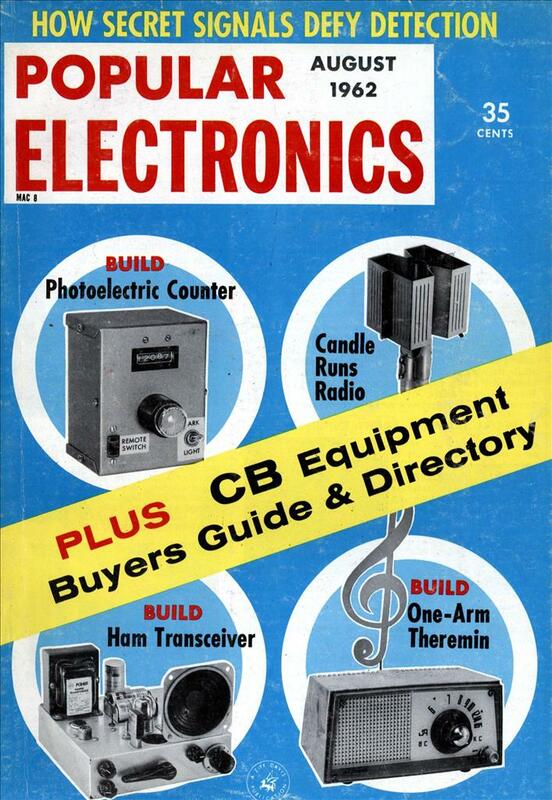 When CB’s first became popular my Dad had to have one. Being a farmer he figured it would be easier to contact Mom if he needed a part or an errand run since his leased land was all over the county. It was a failed experiment; the squawking and constant chatter drove her nuts and she wouldn’t leave the house receiver on. There’s one on eBay starting bid $9.95… guess their value has dropped a little! If indeed it had a range of 6 miles (which I find doubtful) it would suggest a full 5 watts… and I bet those 8 penlight batteries didn’t last long. Ah – the good old days! Ah! The time immemorial spec phrase “up to …” which only exists on paper or a perfect universe. Transmitting at full power at six miles the received signal would be about 85 pico-watts or 85 trillionths of a watt. Now that would be more of a function of the efficiency of the receiver and the wave length than the power of the transmitter. Right around 6 miles would be a perfect spot for the CB band wave length.